Recently, I tried turning on WiFi Hotspot also known as Mobile Hotspot on a newly unlocked Samsung Galaxy S3 but the WiFi Hotspot refused to turn on despite the fact that I tried and touched all the settings under the Mobile Hotspot & Tethering category, It was not even responding at all so I tried a simple trick which I thought will work and eventually worked so I decided to share the simple trick with everyone today in case you or one of your friends also encounter such problem, It may not even be on a Samsung Galaxy S3, maybe on any other Android device. This trick will probably work for you. 1. Head over to Google PlayStore and Search for "Portable WiFi Hotspot Free"
5. Finally, Tethering & Hotspot Active. Now your WiFi Hotspot is on and you can now share your data connection with other devices near you. 6. Open the "Portable WiFi Hotspot Free" Application again to turn off your WiFi Hotspot when you are done using it. Note - Before running the application, configuration is required. You can configure your WiFi Hotspot by navigating to Settings -> More.. -> Tethering & portable hotspot -> Set up Wi-Fi hotspot. 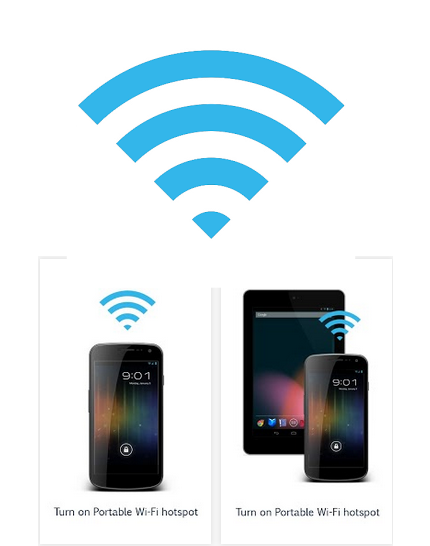 Portable WiFi Hotspot Free App and the application can work for all devices that run Android 2.1 & above and the App is just 78KB in size. Why not try this App maybe it will help fix the WiFi Hotspot issues on your device ? Kindly use the comment box below to drop your comments if this simple procedure and App works well for you and don't forget to share this interesting post with others. Cheers !!! Hi Raj, so glad the Post and App helped you. I was also worried when I first ran into the same problem but that was how I got it fixed. Enjoy !!! I normally dont comment o. google fixes when I searched. but this post has truly helped and it worked. I tried or hours to get my hotspot to come back on after hours. Thank you to whoever made this post. Hi Sherry, glad this post helped you. Thanks for your comment. I'm not sure if this is going to work for you but just give it a try. It's now confirmed working for Samsung Galaxy S5 (AT&T). I recently used this method for mine. Okay, Your Samsung S3 was originally locked to which carrier / network provider ? What's the model of your Phone and what's the result when you tried it ? Hi, Thanks for dropping by ! Welcome Benedict... Hope to see you again soon! It worked for me...thanks a lot. I'll advice you to start all over again cuz it should start working permanently not just for few minutes. I'm sure it's going to work! Try it out. It should work cuz it has worked in so many situations like this. Let me know how it goes!